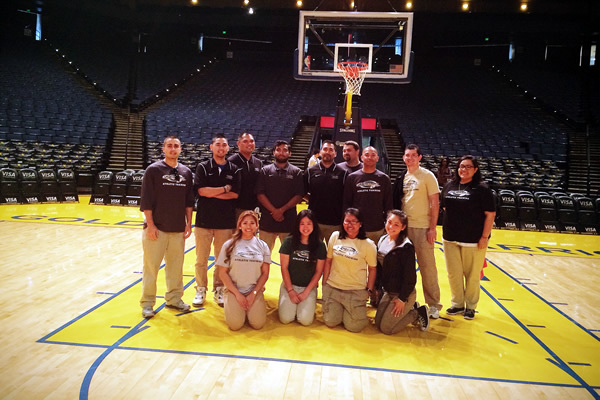 Several members of the Ohlone College Athletic Training staff participated in the 2nd Annual National Honors Society of Sports Medicine Seminar held in Northern California at Oracle Arena, home of the Golden State Warriors, on Thursday, March 20, 2014. High school athletic training students from Northern California, ranging from the Lake Tahoe area to Fresno and all parts in between, participated in the event. Head Athletic Trainer Jeff Roberts was one of the invited keynote speakers and the following Athletic Training Students led group laboratory experience rotations for the attendees.